To draw a portrait has not been a rehearsal (for the most part), the goal is usually to get a likeness with each drawing. Whenever a new drawing is started, the method is the same. Perhaps the method should change, but consistency of technique is where I can examine past mistakes to attempt an unreachable ideal. The imagined perfect drawing doesn’t exist, yet the impulse to create an important drawing is palpable. 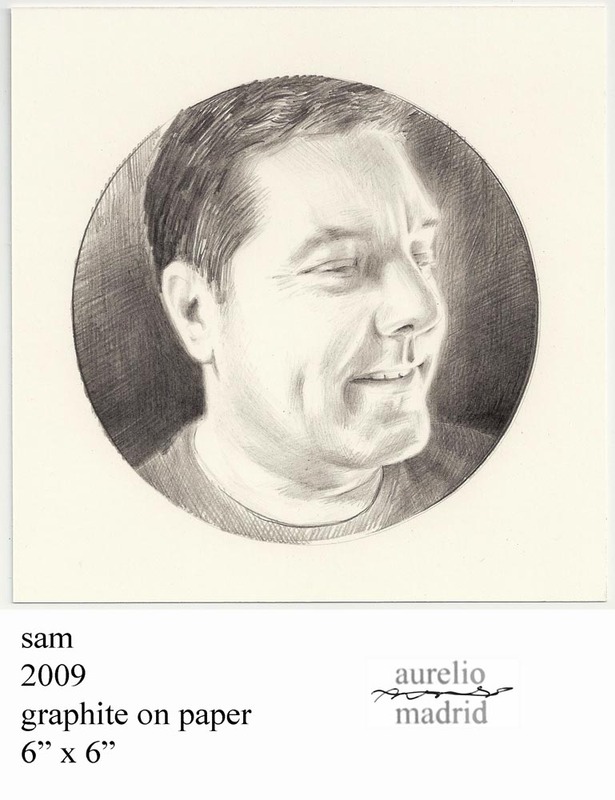 A drawing of a person is different from a photograph of a person. One is not better than the other. A drawing of a person is not necessarily better than a photograph, or even a painting of a person. We can have a bad painting or drawing of ourselves and we can also have a fantastic photograph of ourselves. So when I draw a portrait from a photograph, I’m not suggesting that one is better than the other. Rather, the idea/making/producing of a drawing has something to do with the way that it’s handled. How the drawing is handled (by my hand, by my touch) is of importance for me from the onset. It’s what appears to make a drawing worthwhile. I’ve already said to myself in advance that the drawing should be meticulous, exacting & small. I’ve always thought that a small portrait of a person addresses a kind of concentration of thought. The effort to concentrate on each detail of a face, takes a focus of deliberate expression & precision. This kind of effort should contribute to its overall sucess as a drawing. A portrait is an expression of respect for the subject drawn. Drawing a person’s face for me is (normally) done as an act of respect. I’ve often thought of a portrait drawing as a two dimensional sculpture. I want to see the two-dimensional (photographed) face as having three dimensions. I have to, with a pencil, imagine that a mouth has an interior, or that an ear has its special curves & folds. Each part of the face should look like it belongs to that very person, each aspect of the face has to correspond to the whole to make for a desirable likeness. Every feature of the visible face is directed by the original photograph, which simply captures a moment, a brief moment in time & a moment in that person’s life. Interestingly enough, this moment becomes oddly projected & somehow lengthened through my experience of treating the face as something to be drawn. The time it takes to draw a portrait is also what contributes to the final image. Having a sense of taking one’s time is what has to be patiently extended. The act of beginning a drawing always implies that it shouldn’t matter how long the drawing takes. The drawing is never completed in one sitting, so each portrait takes several days. Every once in a while I’ll do a fast drawing in a day, however that’s not typical. I always reach the end though & some drawings take longer than others. How time is used is as critical as the tangible marks that are made. How a pencil marks paper is also worth examining. A better way to say this might be: how a pencil touches the paper is vital. I’ve had to keep learning how to caress the paper with a pencil, with an attitude that the mark is a human face, an ear, hair & an eye. Usually because the touch on the paper is so gentle & deliberate, it becomes difficult to get the drawings dark enough. The drawings are always threatening to fade away, becoming lighter & lighter. This forces me to press harder, make the lines blacker, make the pupils deeper, thereby creating a sense of depth. Yeah, so pressure & patience are everything. The white of the paper is used as light, or white. This means that what is not drawn, is just as essential as what is drawn. Where there is white, there is an absence of marks. The marks are there to represent tone, value, “color,” line &c.
A face is not a drawing & marks on paper are not a face. With this in mind, an illusion of depth has to be suggested, a moment has to be given time & an image has to be scrutinized for hours. My effort is usually to draw the essence of a particular person’s physical countenance at a particular time, as given to me by a mechanically reproduced image, with the desire to create valued object. 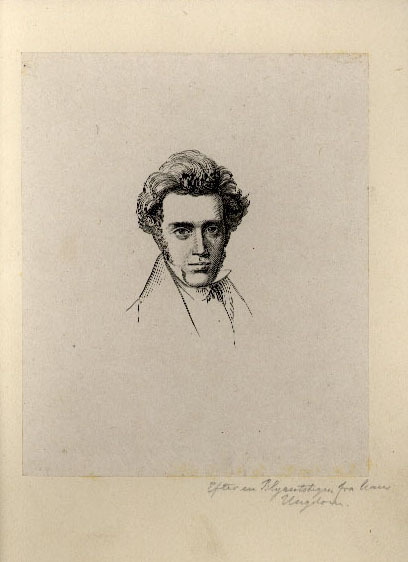 of his cousin Søren Kierkegaard. to paint it. In every face I have seen one or another little fault. haps because he did not bring a certain something with him! enough to be able to love all of us.